Hello Trinidad, DC! Hello 2012! Welcome! As you can see, we’re gearing up to re-launch our social media and 2012 meeting schedule and would love for you to join us! Our new website is currently a little dusty and under construction – please let us know in the comments what would you like to see on it (i.e. types of information, resources, links, etc.). Please “like” us over on our new Facebook page. And, you can now find us on Twitter. Thank you, and have a happy and healthy 2012! 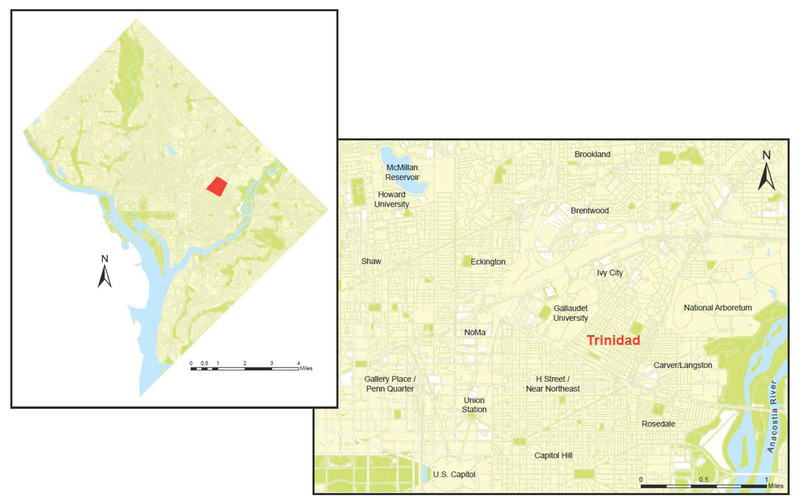 Trinidad Neighborhood Association is a community-based, volunteer-driven organization dedicated to enhancing the quality of life in Washington, DC’s Trinidad neighborhood. Founded in 2009, TNA works to identify and address community concerns, and to promote opportunities for economic development by engaging community stakeholders. Our bylaws were most recently revised and adopted on January 3rd, 2015. Please join us on online on Facebook, Twitter, and Yahoo! groups. The Trinidad neighborhood is located in Ward 5 in Northeast Washington, DC. Bordered to the north by Mount Olivet Cemetery and Ivy City, to the east by the National Arboretum and Bladensburg Road, to the south by Near Northeast and Florida Avenue, and to the west by Gallaudet University, it is a largely residential area with quiet, tree-lined streets and a mix of single-family homes and two-story apartment buildings. The neighborhood is predominantly African American, historically working class, and is home to a substantial deaf student and faculty population.